The sharp blades enable flush parts to be removed where pulling jaws cannot be used. The wedge-shaped separator jaws are secured underneath the component to be removed. The large supporting surfaces protect the parts to be pulled. Ultimate stability when removing, as the separator and pulling device are screwed firmly together. The flat surfaces of the separator blades are used to remove sensitive parts without damaging them. The separator blades provide a larger supporting surface to prevent the parts from twisting. 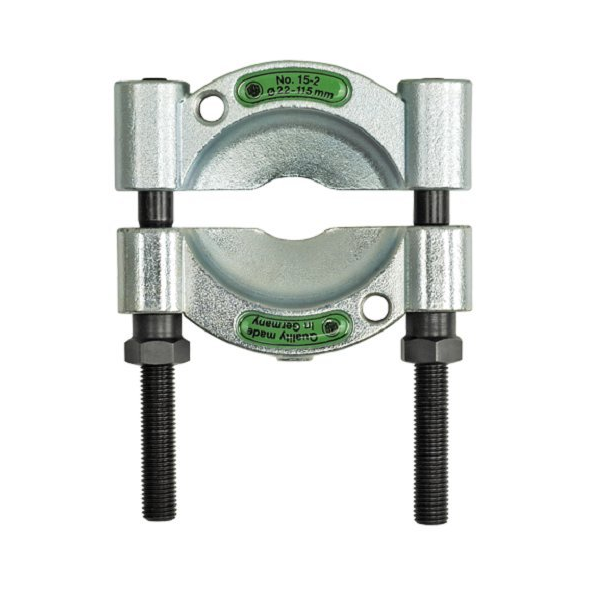 The separator jaws are clamped by tightening the nuts on the side bolts in equal measure. For removal, the tension bolts on the pulling device series 18 have to be screwed into the separator. The part is removed by tightening the spindle against the end of the shaft. The separator blades’ support surfaces must always sit fully beneath the part to be removed.